In this busy modern world many people are heading straight from the gym to work or vice versa, making a quality duffel bag to carry all of their gym clothes and gym gear in a must have. And with our selection of promotional duffel bags and gym bags at Promotion Pros you can have people thinking about your company and brand every time they get in a workout. 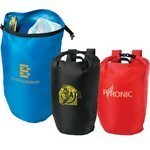 The personalized Lightweight Dry Bag features taped water proof seams and a roll top closure that gives the bag a waterproof seal. This action sport duffel bag has a mesh pocket that is perfect for beverages and makes a great swag bag item for industry expos. The classy barrel bag is made of lightweight and durable canvas fabric, and comes with minimalistic details and a sturdy double handle. 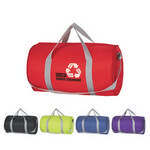 Promote your brand to young men and women with the affordably priced Budget Duffel Bag. Embroider your business logo on this cost effective product to enhance your brand’s image. 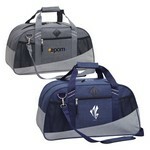 Promote your brand to young men and women with the affordably priced Budget Duffel Bag. Screen print your business logo on this cost effective product to enhance your brand’s image. Our custom logo Burk's Bay cowhide leather sport bag is made from top grain cowhide leather. Our Cabot 16" Duffel Bag features durable 600D polyester construction and allows adding brand logo for Brand Recognition. 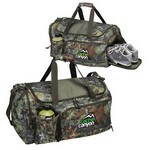 Showcase your logo on Camo Duffel Bag, a practical storage solution that clients will love. Give clients the simple, functional gift of storage through the Canvas Urban Duffel Bag. The cFold Foldable Bag features pass through sleeves that attach to any luggage bag to keep hands and shoulders free and allow adding custom logo for impressive Personalized Giveaways.